Hugo Winterhalter was a saxophonist, composer, arranger and conductor who was a major figure in easy listening music in the post-war decades. Born in 1909 he was a sideman and arranger for Count Basie, Tommy Dorsey, Raymond Scott and Claude Thornhill, and arranged hit recordings for Dinah Shore and Eddie Fisher. He was music director successively for the MGM, Columbia and RCA labels during the ’40s & ‘50s, working with a host of major artists, arranging and producing their hits, as well as recording a string of top class and extremely popular orchestral albums under his own name. This collection, which follows the pattern set by our successful collections of work by Billy May and Percy Faith, brings together a great value 4-CD anthology of his recordings and arrangements over a prolific two decades and more, comprising recordings by the great names with whom he worked, such as Billy Eckstine, Dinah Shore, Tony Martin, Rosemary Clooney, Eddie Fisher, Kay Starr, Perry Como, Doris Day, The Ames Brothers and many others, as well as his own recordings. 1 What More Can I Give You Jack Jenney & His Orch. 2 Stardust Jack Jenney & His Orch. 3 Four Beat Shuffle Raymond Scott & His Orch. 4 I Struck A Match In The Dark Count Basie & His Orch. 5 Basie's Blues Count Basie & His Orch. 8 One O'clock Boogie Count Basie & His Orch. 25 Blue Christmas Hugo Winterhalter & His Orch. 1 The Flying Dutchman Ahoy Ahoy Hugo Winterhalter & His Orch. 2 Bouncy, Bouncy, Bally The Fontaine Sisters..
8 Blue Christmas Hugo Winterhalter & His Orch. 9 White Christmas Hugo Winterhalter & His Orch. 19 Beyond The Blue Horizon Hugo Winterhalter & His Orch. 21 Oh How I Need You Joe Dinah Shore. 22 Blue Tango Hugo Winterhalter & His Orch. 24 Vanessa Hugo Winterhalter & His Orch. 26 Penthouse Serenade Hugo Winterhalter & His Orch. 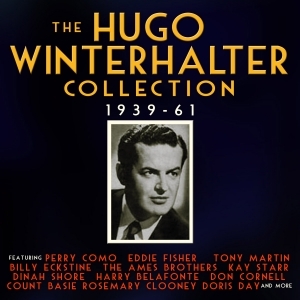 27 Memory Lane Hugo Winterhalter & His Orch. 1 Stairway To The Stars Hugo Winterhalter & His Orch. 2 More Than You Know Hugo Winterhalter & His Orch. 3 Through The Years Hugo Winterhalter & His Orch. 4 Something To Remember You By Hugo Winterhalter & His Orch. 5 Always Hugo Winterhalter & His Orch. 7 The Second Star To The Right Hugo Winterhalter & His Orch. 15 Latin Lady Hugo Winterhalter & His Orch. 20 Seems Like Old Times Hugo Winterhalter & His Orch. 21 Dream Of Olwen Hugo Winterhalter & His Orch. 22 Music Of Manhattan, Memories Of Yesterday Hugo Winterhalter & His Orch. 23 On The Trail Hugo Winterhalter & His Orch. 24 Smoke Dreams Hugo Winterhalter & His Orch. 5 Song Of The Barefoot Contessa Hugo Winterhalter & His Orch. 11 Flaherty's Beguine Hugo Winterhalter & His Orch. 24 Hora Stoccato Hugo Winterhalter & His Orch. 25 Csardas Hugo Winterhalter & His Orch. 26 The Carioca Hugo Winterhalter & His Orch. 27 La Cumparsita Hugo Winterhalter & His Orch.